California has made significant strides in expanding access to health care coverage due in large part to the federal Affordable Care Act (ACA), which President Obama signed into law in 2010. However, these gains are threatened by the current effort in Congress to repeal the ACA and drastically scale back the federal government’s role in health care financing — an effort being led by Senators Lindsey Graham (R-SC) and Bill Cassidy (R-LA), with support from President Trump and the Republican leadership in the US Senate. Given a fast-approaching deadline, the Senate could vote on the Graham-Cassidy proposal in the coming days, although it remains unclear whether there are enough Republican votes to move the bill forward. Among its many damaging provisions, Graham-Cassidy would repeal — starting in 2020 — the ACA’s coverage expansions. This rollback would target both the ACA’s marketplace subsidies, which help reduce the cost of private health insurance for people with low and moderate incomes, and the expansion of Medicaid eligibility to millions of low-income adults — including those without dependent children — who were historically excluded from coverage. (Medicaid is called Medi-Cal in California.) As envisioned in Graham-Cassidy, the federal funds that would have supported these ACA coverage expansions would be sharply cut and then redistributed to states as block grants that would be funded only from 2020 to 2026 before expiring. The amount of each state’s grant — which could be spent “on virtually any health care purpose” — would be determined based on a formula that would significantly disadvantage California and other states that have successfully implemented federal health care reform. In addition to creating these temporary block grants, Graham-Cassidy would radically restructure federal financing for the rest of the Medicaid program (outside of the expansion) by providing states with a set amount of federal funds for each Medicaid enrollee — also known as a “per capita cap.” With this change, federal funding would no longer be tied to each state’s actual costs of providing health care through Medicaid. Instead, annual increases in federal funding would be tied to an inflation factor that would fail to keep pace with the projected growth in Medicaid expenditures. As a result, a rising share of Medicaid costs would shift from the federal government to the states. This would put unsustainable pressure on state budgets and force state policymakers to debate what to cut and/or which taxes to raise in order to address the inevitable federal funding shortfall. Supporters of the Graham-Cassidy bill make no secret of the fact that it is intentionally designed to take federal funding from states such as California that have successfully implemented the ACA, and shift these dollars to states that have been skeptical of — if not outright hostile toward — health care reform. For example, under Graham-Cassidy’s proposed block grants, California would lose $56 billion in federal funding from 2020 to 2026 (a 23 percent cut), compared to a $34 billion (75 percent) gain for Texas during this same period, according to estimates from the Kaiser Family Foundation (KFF). Such a massive cut to California’s health system in the early 2020s would jeopardize health coverage for millions of Californians, including the nearly 4 million adults who currently are enrolled in Medi-Cal thanks to the ACA expansion. 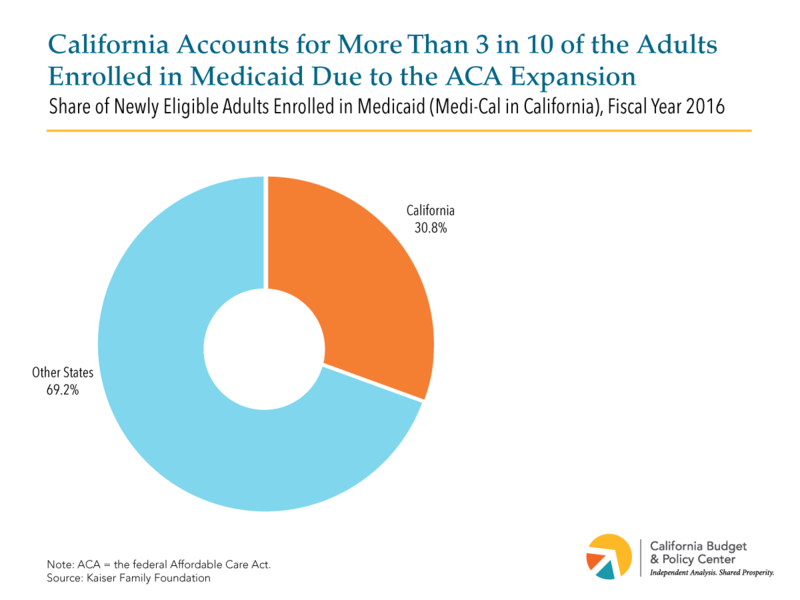 Graham-Cassidy’s plan to end the Medicaid expansion with no specified replacement, while also cutting federal funding for this population, would disproportionately impact our state: Californians account for more than 3 in 10 of the roughly 12 million newly eligible adults who are enrolled in Medicaid across the nation. First, as noted above, the state-based block grants would vanish after 2026. (In theory, Congress could renew funding for these grants beyond 2026. In reality, “Congress likely couldn’t afford to fill” a funding gap totaling hundreds of billions of dollars per year.) Ending the block grants would zero out critical federal health care funding for all 50 states. California would lose $44 billion in 2027 alone, according to KFF estimates. Second, the formula used to calculate federal Medicaid funding under the per capita cap would become more restrictive starting in 2025. This would ratchet up the cost-shift to all 50 states and result in cuts that would grow in the coming decades. For example, KFF projects that California would lose $1.7 billion in federal funds due to the per capita cap in 2027 alone, compared to a cumulative funding loss of $5.7 billion during the seven-year period starting in 2020. Could California take on tens of billions of dollars in new spending obligations in the wake of massive federal funding cuts? The answer clearly is no. The Governor and lawmakers would be faced with the prospect of making devastating cuts to publicly funded health care programs — cuts that would affect millions of Californians with low and moderate incomes, including families with children, older adults, and people with disabilities. One estimate suggests that nearly 7 million Californians could lose health care coverage in 2027 under Graham-Cassidy.